Tibi, the young Roman heoine of this book has to deal with a (still) very modern problem: she is abused by her father. What she needs is another Father to love her, and a champion to fight for her. She finds the first in the Person of the Christian God, but she is reluctant to put her trust in Him. She finds the second in Alexius, a Greek gladiator with a 'reputation' among women, and a past that has made him cynical and bitter. Tibi is different to him, however, he feels protective towards her, and he respects her. Of course, the path to romance is not smooth either. 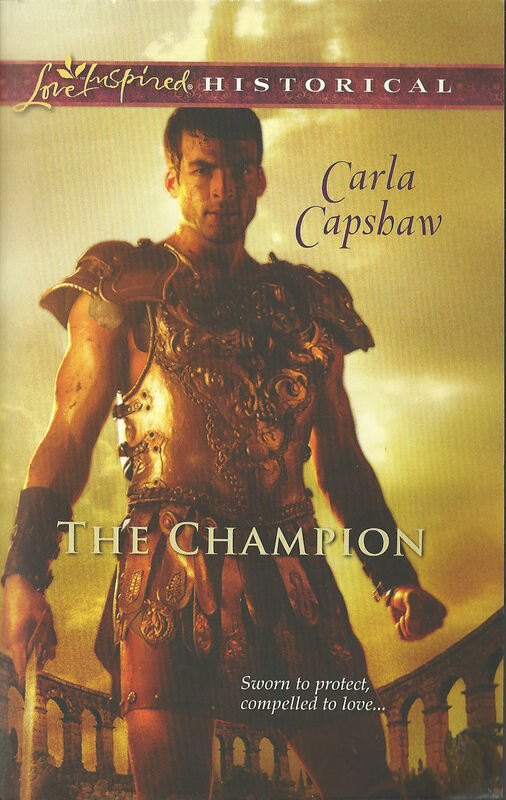 This is the third book in Carla Capshaw's Rome Series, and I loved it almost as much as the first, which is high praise indeed, since The Gladiator is one of my most favorite books of all time. The romance was sweet and deep. I love it when the romance is deep and not shallow, you know, like 'you're so pretty', or, 'I can't help it, I want to kiss you'. None of that in this book. The hero and heroine become friends, learn to care about what troubles the other person, even rescue each other vitally before their romance comes to its full bloom. I loved the romance in this book, it was really well written, the dialogues as well as the more tender scenes. What I also loved about this story was that neither the hero nor the heroine were christians at the beginning, and they have to find their way through obstacles and distrust to find the new and forbidden God of the christians. I, the reader, watched them journey from unbelief, from wavering and doubts to firm belief and faith, and I was amazed. I especially liked the fact that they had to be disappointed in every other way, by their friends and relatives, by the Greek and Roman gods, before they could in all honesty turn to the One true God. I think that is the way it happens for many people in modern days too, and it was very realistic and moving. The historical detail is exquisite, of course, as in the previous books. This makes this little trilogy a treasure since there aren't many novels about the first christian years in Rome out there. And none as well written as these, except perhaps the classics (The Robe, Quo Vadis, etc). There was a lot of action in this book also, and for me the plot and the romance just took off as soon as the hero and heroine were in danger. I recommend them to any fan of historical and romantic novels. I received this book from the author, for which I thank her very very much. This book is out now. The Protector is the second book in the trilogy (althgouh each book is its own, individual story). P.S. I hear Carla Capshaw is writing another series set in the Victorian Era. Yay!!!!!!!!!! Alexandra, thank you for another wonderful review. I'm blessed to have met you and I'm so happy that you enjoy my books. BTW, did I get most of my Greek facts right? Wonderful! I'm writing as quick as I can. :-) Thanks for being so great!